Most of you know that I am a very frugal person. When given a choice, I will almost always go with the less expensive item — even if the more expensive item is closer to what I want. I can persuade myself out of buying almost anything, and it’s not often that I buy anything I don’t truly need (and can’t find something in my house to “make due” for a little bit longer). However, I’m working REALLY hard to get better at splurging every once in a while, especially when it comes to quality items that I will hopefully have and use for years to come. Here are a few of the things I’ve recently been allowing myself to splurge on. 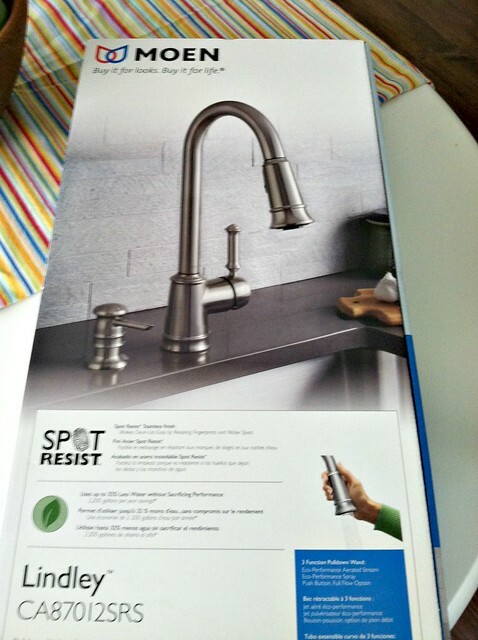 When we were renovating our kitchen 2.5 years ago, I was debating which kitchen faucet I should buy. The one I really wanted was about $250 (which seemed TOTALLY ridiculous to me at the time). I could easily get kitchen faucet for under $100 — but they weren’t the one I wanted. After WAY too much internal debate (and talking with Dave) I finally decided to “splurge” and get the one I wanted. After all, think of how many thousands of dollars we spent on our kitchen renovation, not to mention the fact that we’re hoping to live in our house for many years to come, so that cost, broken down over time, would only equal to a few dollars a year extra. 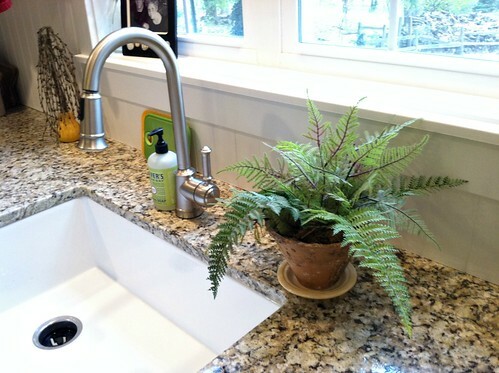 And yes, we LOVE our spot resistant kitchen faucet! I can tell my mindset is definitely changing after almost 4 years of renovations because I’m finally starting to seek out quality items BEFORE even looking at the price. 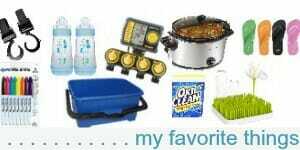 I know the brands of products I like (GE for kitchen appliances, American Standard for toilets and sinks, Moen for bathroom fixtures, RugsUSA.com for rugs, Destination Lighting for all our lights, Behr paint, etc. etc.) and I know that they hold up well so I’m willing to spend a little bit more for those items. In general, I’m trying to develop the mindset of: “we’re hopefully going to live here for a long time so just buy something you like that will last”. 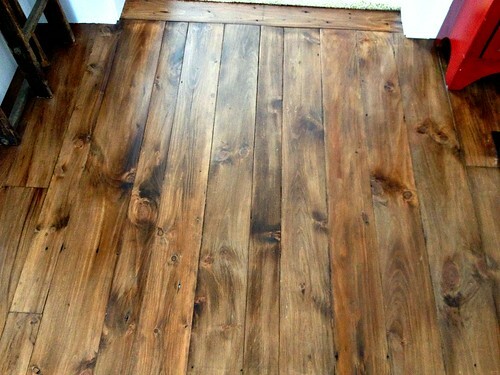 This has helped me tremendously when buying things for our home. Obviously, I’m not just going to go spend money for the sake of buying something, but I’ve felt more freedom to buy what I really want (like my farmhouse sink and our reclaimed barnwood floors), versus settling for something that’s just a little bit less expensive. So far, I haven’t been disappointed by these small splurges! 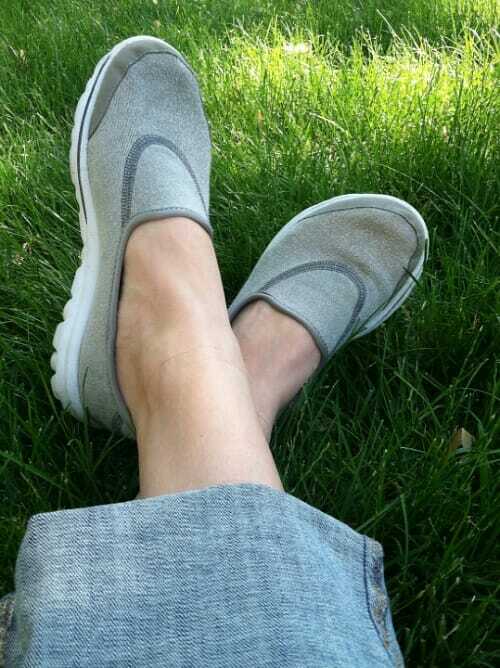 Almost 2 years ago, I got a pair of grey Skechers Go Walk shoes and they immediately became my most favorite pair of shoes. I loved them so much that the next time they went on sale at Kohl’s, I snatched up another pair (in coral) with my extra 30% off coupon! I’ve also purchased 2 pairs of shoes from Naturalizer.com (black and tan). Both pairs were close to $80 full price — but I was able to get one pair for $19 and the other for $29. I’ve had the black pair for almost 5 years now and they are still one of my favorite pairs of shoes. I’ve had the tan ones for a year and they are SO comfortable and still look brand new. If you’re wondering, my black pair is very similar to these shoes… and my tan shoes are similar to these. Even if I hadn’t gotten such amazing deals on these 2 pairs of shoes, they would have been worth EVERY penny I spent on them for how comfortable they are on my feet. I will definitely be looking to Naturalizer the next time I need practical shoes! I know — this sounds so stupid to say I’m “splurging” on groceries — which are obviously a necessity. However, as I shared last month, I made a small goal to add a few more “high quality” foods into our diets, which means I need to be willing to splurge a bit more on groceries each week. It’s definitely nothing major, and I still have weeks when I get out of the store for less than $40 — but normally, it’s closer to $80 or $100. I realize that’s still less than what many people spend on groceries, but it definitely feels like splurging for me — and it’s not always easy to do! Although I’m a HUGE HUGE HUGE fan of “buying used”, technology is one thing we have almost never purchased used. Besides a TV that we purchased from people from our church, we have “splurged” on buying all our computers, phones, tablets, etc. brand new from the store. I guess I just feel better knowing that we have a warranty and protection plan just in case something goes wrong. Plus, with how quickly technology changes, I like knowing that we have a newer model that won’t become outdated so quickly. The products themselves are SO easy to use, they have very few issues, and any time an issue does arise, their customer service is the absolute best customer service I’ve ever worked with… EVER! 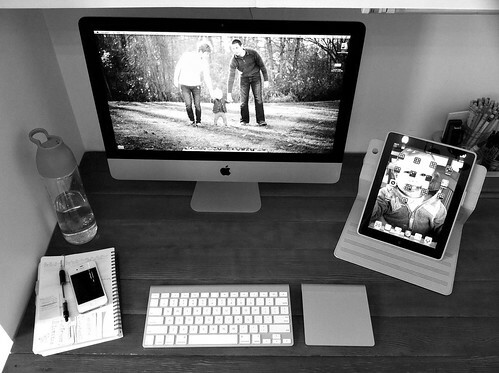 Add in the fact that all our devices “sync” together and are linked with our Apple ID’s… and it’s a recipe for stress-free computer usage (which makes my life as a blogger SO much easier). Obviously, there are still many things I’m not willing to splurge on at this point in my life — not because they are bad or aren’t worthy of splurges. It’s usually because Dave and I weigh the pros and cons of saving versus splurging on that particular item… and “saving” wins out for one reason or another. Both Dave’s and my parents drive brand new cars (paid for with cash). We also have several friends who drive brand new cars (although I have a feeling they weren’t all paid for with cash!). The new cars are great and often have fewer issues and last longer — however since neither Dave nor I are big ‘car people’, we have always opted for used cars in an effort to save a BUNCH of money. We could care less if our car is 5-10 years old, as long as it isn’t rusty or doesn’t have any major issues. Someday, we might decide to splurge on a brand new car, but for now, we’re more than happy to save a bunch of money on used cars. I know, this is a weird one — but I usually get our socks from the dollar store (besides Dave’s dress socks). So far, they have held up well and you really can’t beat 6 pairs of kids socks or 2 pairs of adult socks for $1!!!! Then, when they get holes in them, I never feel bad about tossing them. I realize this one might seem a little odd to many of you as furniture is often something people splurge on. However, I change my mind A LOT… and I like to switch things up, redecorate, and rearrange my room on a regular basis. So if I would splurge on a super expensive couch, I would most likely feel obligated to keep it forever (or at least 20-30 years!). However, since we almost always buy used furniture (or get it from IKEA) I never feel bad about selling something to get something else. I sell the stuff I no longer want on Craigslist and replace it with other inexpensive finds. I usually end up coming out ahead in my deals too! Another reason we almost always buy used or less expensive furniture is because we have 2 little kids with another one on the way. 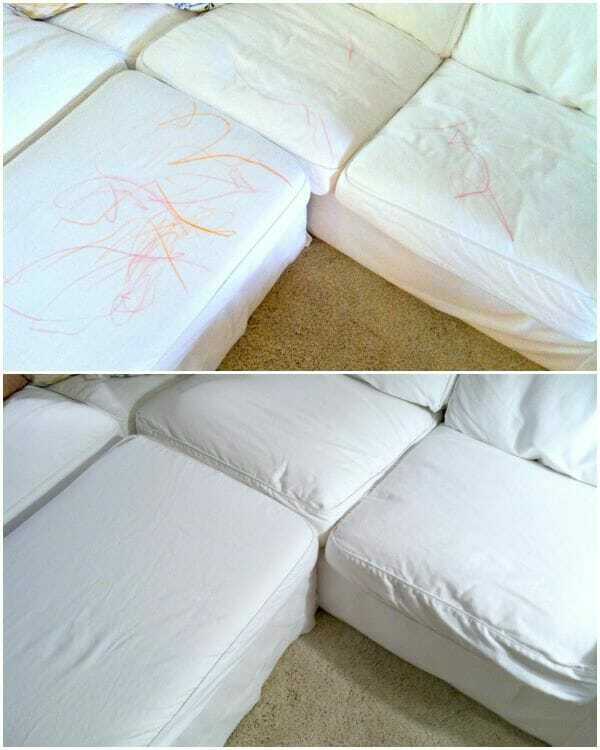 I don’t want to be worried about my children “accidentally” coloring all over my $5,000 dining room table or my $11,000 living room sofa. I paid $50 for our current dining room table and our slipcovered IKEA couch has been colored on, spilled on, and stained more times than I can count — but I just put it in the wash every now and then for a brand-new-looking couch. So how do I decide when I want to save a little (or a lot) of money and when it’s time to splurge? 1. How long am I planning/hoping to use this item? If my answer is “a long time”, then it’s probably worth the splurge — like in the case of our home renovation items, plumbing fixtures, quality shoes, etc. If my answer is “not very long”, then it’s probably better to save — like with vehicles that we usually replace every few years, socks, or furniture that I’m always rotating. 2. Will I be extremely upset if I spend the money and something happens to the item or my kids ruin it? If my answer is “no, I won’t be upset”, then it probably means that I can splurge because I won’t lose much if something happens to the product or item. I suppose if you really want me to get detailed about it, there is a little bit more that goes into my decision-making process; but these 2 questions have significantly helped me to simplify my choices to save or to splurge — and you know how much I like “simple”! 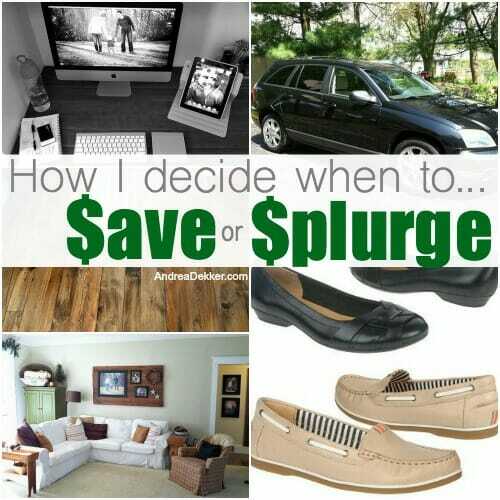 How do YOU decide when to save or splurge? I understand what you are saying. I really liked the living room furniture at Pottery Barn. It was so expensive. We went to a discount furniture store and found almost exactly the same thing for so much less. Do you ever consider the ecological affects of new vs. cheap vs. ecological? I used to think that making the “green” choice meant spending more money but I’ve often found it’s the opposite. Used furniture, technology, clothing, etc. is almost always cheaper. Do you take that into consideration? Thanks for the great advice! I’ll be honest, I’m not too hyped up about “going green” because as you stated, I think it often ends up being more expensive and most wasteful in the end. I know people who have “trashed” all their food storage, pots, pans, bakeware, etc. to then go out and purchase all new eco-friendly ones. It would have been so much smarter just to keep using what they had until it wore out and then slowly replace it as needed. Also, I personally think that buying used (which is what we almost ALWAYS do) is probably more environmentally friendly than buying something eco-friendly brand new from the store. My husband and I have a rule to always buy the best quality tools that we can afford as long as it is not a minimal use item. About 11 years back we bought a table saw. It was not el cheapo, but not what he would have truly wanted. Over time he realized it just was not precise enough for the cuts he needed to make. We ended up giving it to friends, and buying a much higher quality saw that he uses frequently. I fully agree with quality when it is an item that you will use (and hopefully enjoy!) for years to come. I actually splurge on socks. I can’t stand when cheap socks get all stretched out and fall down. haha — yes, I know what you mean. The socks we get at the dollar store are not dress socks — they are just white ankle socks so they can’t really fall down. They have actually held up surprisingly well for the price! When you buy off of craigslist, do you ask for a lower price than what they have it listed? It totally depends on the item and the listed price. If I feel it’s a good price, then I’ll just buy it at as is — but I definitely don’t hesitate to negotiate a little if I feel the price is too high. You can always join the odd sock movement if one has a hole and the other doesn’t! Hi Andrea, I’m a long time lurker who now feels comfortable enough to comment. I read so few blogs as I have limited energy health wise, but yours is the one I read purely for posts like these and so much more! I agree there are some areas to splurge. Although I flee at the mention of Apple, which my entire family adores, I agree with you on technology. New is safer. I do have one exception when I bought an almost new 7 inch tablet. I already had a 10 inch one, but, since I find it hard to write much, I wanted one I could pop in my handbag without stressing over getting mugged. I must point out I’m majorly paranoid about being out with technology. The tablet was the same model as the 10 inch, and more than serves its purpose, making it easy to work on my novel if I have a free 5mins. Other splurges do include buying specific brands for soap/shampoo. I’m from England and tend to use Dove and Spa Magic products since they agree with my skin and are moisturising. I also sort of splurge on food, but I hasten to add I’m single with no dependants so it is easier to do this. I get a lot of organic food, including milk and yogurt because my health condition is complex and I want to give my body what I see as the best I can. I’m hoping to leave my job this year, so I may have to re-evaluate my grocery buying. I don’t stress if food isn’t organic, especially when it comes to chocolate! I manage to save buy being on Amazon subscription – I think you have it in the US. Saving that 15% on essential items each month soon adds up! Also, I know a lot of people who splurge on food — we do too sometimes… and sometimes I save. I guess it just depends on the type of food — but I definitely don’t think splurging on food is crazy or unreasonable! If the thing that I am buying is small and I will have no regret in replacing it (like socks) I will have no qualms over buying cheap. 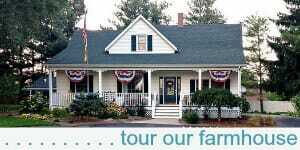 But for things that are big, we prefer to buy new and splurge, mainly because of the one time cost associated with it. The longevity and returns help in the decision making too. All that aside, I love the way you look at life! 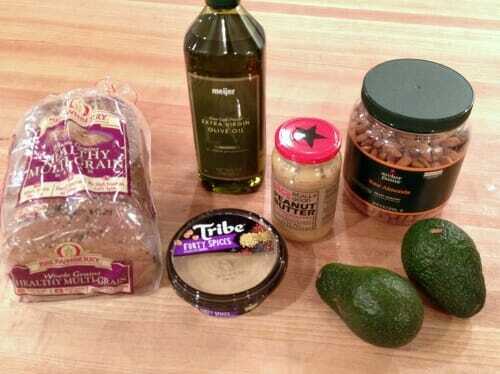 I started reading your blog a few years ago and you have inspired me to live simply & comfortably at the same time. For instance, with my tax returns this year, I thought about what you would do with the money: I decided to put 60% toward debt, 30% toward savings, and 10% was “fun money”. 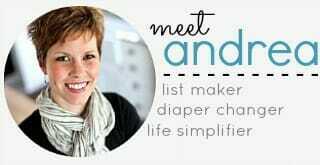 It’s kind of funny that I find myself thinking on a regular basis, “What would Andrea do?” Thank you for your sensible outlook on life & for sharing it with your readers. It is so appreciated! Wow Hannah — way to go paying off that debt! When I want to make a splurge (for necesities or just because I like somtehing), I give it a week. If by the end of the week I still want to buy the product (so the real fact is, if I remember what I wanted to buy), then I REALLY want it and go for it. Also, if I still think about it in the week that follows, I have time to research, maybe find it cheaper elsewhere, etc. Most of the times, I forget in 2=3 days what I wanted to buy and I end up not buying it. So giving a little time and not rushing to splurge is my way to do it. In my country, I think that more than 50% of the cars are second hand ones. It is said that if you buy a new car, the second you get out on the gate where you bought it, it depreciates buy 30% at least, So if you want it to sold it the next day, you would only get at ost of 70% of its original price. Yes! I even say just to wait 24 hours. It’s amazing the things that aren’t worth it to me just a day later! I’m a major procrastinator when it comes to purchases. I tend to try to buy good quality and it lasts. A Sony tube TV bought in 1988. Works perfectly. My Moen faucet however succumbed to our horrid harsh water. I am sad. My Harden Brass fixtures all succumbed to the water too. Lesson learned: move or buy cheap. Food is a huge expense. Since we eat no gluten grains, corn or legumes we eat a lot more fresh fruit and vegetables. I buy best quality, and when possible make my own from scratch. Example: I absolutely never buy jarred products such as mayo or spaghetti sauce and never anything with soy or canola. I do buy mustard since it is too hard to make it. Just yesterday I encountered a lady buying jarred tartar sauce. I told her she could save big bucks by simply making her own. I make mayo with a stick blender and it literally takes 30 seconds to blend it. I use one egg, one cup of olive oil and some home grown lemon. Add chopped cuke, dill and voila tartar. I don’t buy any snacks for us adults except I will keep some cut carrots and celery and homemade dip or on the rare occasion we have tortillas, I make chips. My splurges are good beef, chicken and dairy. I also would rather eat less sour cream that is 100% made from milk than faked out low fat stuff full of fillers, gums and seaweed. Computers: I am so sick of Windows so I want to get rid of my computer and get a Mac book. I met a gal at Best Buy who is the apple rep there who texts me when they have an out of box model of anything. I saved a ton on my iPad air 2 thanks to her. Not used ever, merely open. Motor oil and filters, tires, air filters, spark plugs. Carpet cleaning. We leave it to the pros. Window washing I do myself but once a year I have pros since they do stuff I can’t. Coffee. I hate cheap generic coffee. Ditto for coffee filters. Food storage containers. I only use glass. Cookware I only use Made in USA stainless. (Another word for that is All-Clad, tee hee) or, for baking Pyrex or Corning. Paper products like TP and paper towels. I won’t buy those that are make from recycled paper after learning that cash register tape ink contains BPA and there are metal flake contaminates in recycled paper that can cause microwave ovens to arc. We use paper towels in cooking a lot, lot draining bacon. That’s pretty much it. I wish I could say I scrimp on paying to be connected. Good call on the faucet. Moen guarantees them so they will send you parts or a new one if it breaks or leaks. $100 faucet would probably not last very long. Think about how many times a day it gets used. Agreed — and good to know that Moen is good about replacing parts! Have you checked to see if three car seats will fit in the back of your car? Our Pacifica is a 3-row vehicle, so 2 seats up front, 2 in the middle, 2 in the back — however, with the back seats up, there is absolutely NO room for any storage at all… So we’re trying to figure out how we want to try and work things before summer hits. We’re thinking to put Nora and Simon in the back, then the baby in one of the middle seats with the other middle sit totally folded down so we can easily access the 2 in the back. We won’t have much storage that way, but it’s probably the best solution for now. 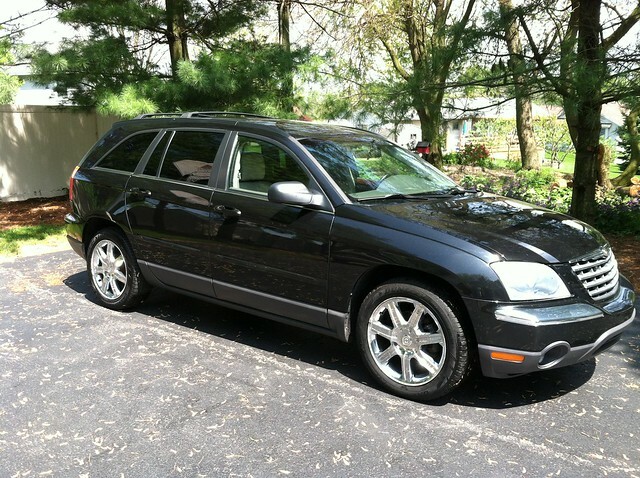 That said, if we find a great deal on a minivan, we’ll probably jump on it and sell our Pacifica! We have 4 in carseats w/a 7 passenger SUV (3 in middle, 2 in back)…and it was indeed a challenge to figure out the best seating configuration. – I checked reviews & safety guidelines before I purchased, and this one was highly scored. These boosters are super easy to move for easier access when needing to get into the 3rd row. Storage is the biggest struggle, especially for strollers! (most don’t fit behind the 3rd row when the seat is up). I had to find umbrella-fold style strollers. It isn’t perfect, but it folds very compact (folds like an umbrella stroller), universal car seat attachment (so I can still use my existing Graco carseat for a travel stroller). Double strollers are exceptionally difficult to find. The only one I’ve found is no longer manufactured (I found a replacement on Craigslist). It’s the Eddie Bauer tandem double stroller (again folds like an umbrella stroller): The Joovy Caboose To Ultralight might be work too: http://www.toysrus.com/product/index.jsp?productId=18409726&cp=2255957.2273443.2256189.2256200&parentPage=family. Nora just turned 3, so I don’t think she’ll be ready for a booster for a while yet — but I guess I should look into the rules. Michigan’s laws just changed again and got even MORE strict. Seriously, I think our kids will be in carseats until they start driving! I have a four yr old, two yr old and 6 month old. We ended up upgrading to a minivan. I said I would never drive one, but I love it. We just bought my four yr old a five point Britax booster. She is excited to be in a big girl seat, but I like it for the safety. Hope you find the best configuration and happy minivan hunting! I actually had no idea the dollar store carried socks! Having all boys, socks are my absolute nemesis! I used to cut up holey socks and use for rags, but I just confirmed that my goodwill accepts rags for fabric recycling, so I ‘splurged’ on some microfiber cleaning cloths, and took all the gross socks to goodwill! Now I’ll have to check out the dollar store socks! Well, I can’t vouch for all dollar stores but the one by us has TONS of random stuff (including lots of socks)! !